As you may remember, 2012 was another year that began with the regrettable, futile decision to avoid buying any more cookbooks. But, one of the curious things about New Year’s resolutions is that you must overcome a certain barrier to break them. This situation is analogous to a biochemical paradigm, the so-called “energy of activation,” to make a reaction go forward. It’s that little kick an enzyme provides, by binding its substrate, that causes a normally slow reaction to happen right away. Two things boosted me to buy Fast, Fresh, and Green. First, Susie Middleton wrote it. Having known her for a long time as the editor of Fine Cooking, I expected a great book. Then, I read reviews on amazon.com and THAT was the catalyst, the activation energy, the end of my inner debate. Reaction CATALYZED, iTunes contacted, book delivered to My Preciousss within 2 milliseconds!! Below I share with you a recipe, a teaser, and my thoughts on the book. Heat your oven to 475 F (or 245 C). Line a large rimmed sheet pan with parchment paper. Cut the acorn squase in half lengthwise. Scrape out the seeds and fibery stuff with a spoon. Place each half, with the cut side down on a cutting board, and slice a little less than an inch of both ends. Discard the ends. Slice the squash crosswise into 1/2 inch slices, and place them over the prepared baking sheet. Melt the butter in a small saucepan. Remove the pan from the heat and add the maple syrup, vanilla, and cardamon. Stir well to combine. Use a brush to lightly brush the slices of squash with the a little less than half the amount of butter. Season lightly with salt and turn the slices over. Brush the second side with the remaining melted butter, reserving some to brush at the end (optional). Season the second side with salt. Roast the squash for 12 minutes. Carefully flip the pieces over, and roast until nicely browned, 10 to 12 minutes more. If you want, brush with a little more butter before serving. Baby-bella mushrooms are sauteed in a simple sauce full of flavor and with a few unexpected twists… They turn out with just the right amount of heat and a sweet and sour hint. Perfect alongside many main dishes. We had it with a T-bone steak. Contrary to many cookbooks in which chapters ate divided either by season of the year, or ingredient, Susie Middleton went through a different route, sorting recipes by method of preparation. I really like that. Quick Roasting: My favorite chapter of the book, as I love roasting veggies but usually my impatient nature prevents me from enjoying them too often. 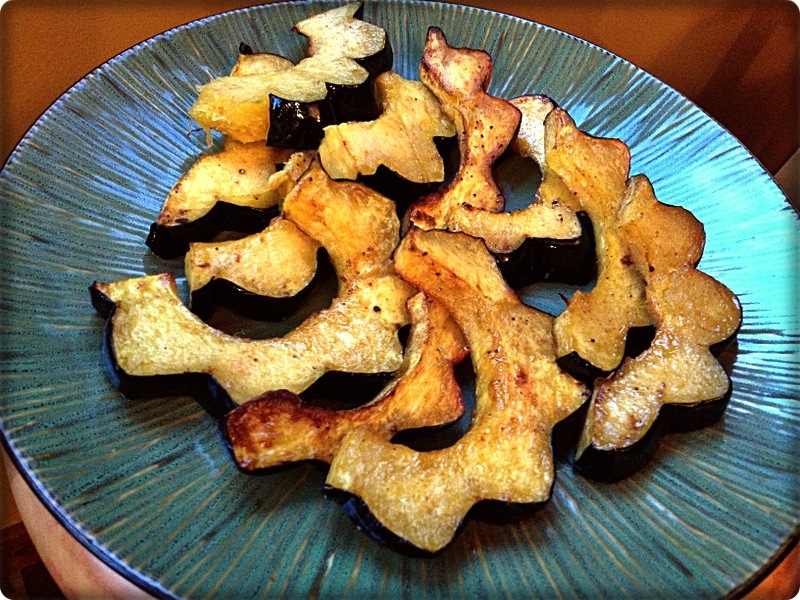 The acorn squash rings featured in this post is an example found in this chapter. Some other tempting dishes from the same group: Quick-Roasted Cauliflower with Zesty Orange-Olive Dressing, Quick-Roasted Beet Slices, Sweet Potato “Mini-Fries” with Limey Dipping Sauce and Spiced Salt, Caramelized Plum Tomatoes in an Olive Oil Bath, Roasted Turnips and Pears with Rosemary-Honey Drizzle. Quick Braising: I think quick braising and stir-frying are two of the most common techniques used in the home-kitchen, and in these categories Susie really shines. All recipes come with some creative twist, an expected flavoring, or combination of ingredients that makes the most humble veggie take center stage. Some examples: Quick-Braised Green Beans with Pomegranate-Balsamic Pan Sauce, Cider-Braised Baby Bok Choy and Golden Apples, Braised Carrots with Blood Orange-Fresh Tarragon Pan Sauce, Silky Braised Fennel in Pink Sauce (this will be my next recipe to try from the book). Hands-On Sauteing: These are recipes that require you to stay around the stovetop doing some baby-sitting, but they come together in lightning speed. The teaser recipe, Mahogany Mushrooms, comes from this group. Other recipes on my list to try: Corn Saute with Chile and Lime, Sauteed Carrots with Warm Olive and Mint Dressing, Sauteed Savoy Cabbage with Apple Cider Butter (oh, my…), Brown Butter Summer Squash “Linguine”. Walk-Away Sauteeing: As the name indicates, once you start cooking, there’s plenty of opportunity to do something else, work on a main dish, play fetch with your dog, or stare at the window admiring the arrival of the Fall. Some tasty examples include: Gingery Sweet Potato and Apple Saute with Toasted Almonds, Carmelized Green Beans and Sweet Onions, Sauteed Turnips with Ham and Molasses, Southwestern Butternut Squash Saute, Smoky Spanish Carrots and Fennel with Toasted Hazelnuts. Two-Stepping: includes recipes that call for boiling the vegetables and then continuing with another type of preparation, like sauteeing, or inclusion in a salad. I absolutely MUST make the “Brown Butter Asparagus with Pine Nuts” from this chapter. But there’a a lot there to chose from. Stir-Frying: A collection of very tasty options for stir-fries, with additions such as black bean sauce and balsamic butter to make them special. Grilling. Reading this chapter it occurred to me that I only grill two veggies: eggplant and zucchini. If you are like me, Susie will definitely open your horizons to include mushrooms, asparagus, even potatoes. Baking Gratins: This is the slow-cooking chapter that closes the book. I don’t think any book on veggies would be complete without some gratins, the comfort food by default. Some examples: Mini-Potato Gratin, Slow-Roasted Heirloom Tomato Gratin, Christmas Kale Gratin with Sun-Dried Tomatoes, Harvest Gratin of Butternut Squash, Corn, and Leeks. Susie, thanks for allowing me to share a recipe from your book! Like you, I’ve stopped buying cookbooks — at least until I read the ones I’ve most recently purchased. I don’t want to collect cookbooks[ I want to use them. Now, this acorn squash recipe and your review has me rethinking my stance about cookbooks.. The squash sounds wonderful and I cannot wait to try it for myself. And one more cookbook really isn’t so bad, is it? We haven’t bought any in a while, but have no outright ban. Those are just meant to be broken. Cardamom is such a great spice. I love this recipe. Love the title… I’m thinking it could work for my blog (especially the fast part – haha ;-)) – it’s odd, I don’t really use cookbooks… I waste quite a bit of money though on glossy cooking magazines… (we all have our ‘things’ :)). 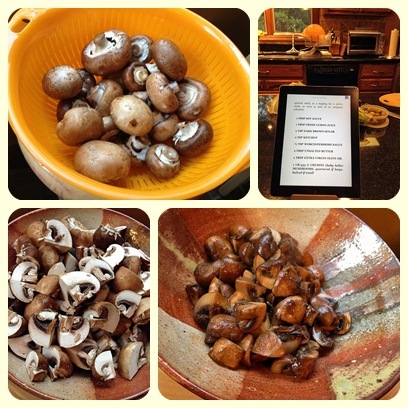 Every once in a while a great cookbook comes around – I’m thankful for your review otherwise I would never know about this useful book – the mushrooms have my toes curling (total mushroom girl). The squash rings look great too – so innovative and perfect for the season. Yum! Thanks for the review Sally. I saved the life of all of her rejects. The squash looks great – and as someone who is dying to try them despite the hairy eyeball from my husband I will be making this soon! Thanks for sharing. You made me all emotional with your brave attitude – saving the life of all those rejects! We need more people like you, my friend…. I am selfless and self sacrificing! And humble… most of all humble!! Popping in from our adventures…and so glad that I did Sally!!! I am definitely putting this on our menu for Thanksgiving (and a few more random nights this season). I love cardamom too. Isn’t the aroma just incredible?! This sounds like a great cookbook and I don’t blame you at all for giving in and getting it. The title alone would have me hooked. Fast and fresh – two things I need right now. And of course green is always a bonus. It sounds like I could learn a great deal from this book too. Hey there! You are NOT supposed to be surfing the net, lady! But I’m glad you stopped by… Fast and fresh is a must these days for us too. I have her other book, and now I need this one too! I already know I’ll love it. And, yes, Thanksgiving is quickly approaching! I’m a cookbook hoarder too but I’m seriously making an effort to stop myself from getting any more. The squash looks delicious, Sally! Thanks for stopping by! I have my mind set on your beautiful braided (or should I say twisted? 😉 bread for this weekend. I love cardamom too, If it was up to me, I would put it in everything.